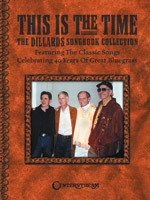 This songbook features classic songs from 40 great years of bluegrass by the Dillards. Contains many of their most requested songs, including those performed by The Darlins' on the Andy Griffith Show. 26 songs, including: Dooley, There is a Time, Old Man at the Mill, Buckin' Mule, Nobody Knows, Darlin' Boys, Shady Grove, Hickory Hollow, Gimme Chaw T'Baccer, Cold Trailin', Lonesome Indian, Somebody Touched Me, and more. Melody and lyrics with chord symbols, with one song (Banjo in the Hollow) in banjo tab. This book also features a discography of the Dillards, a message from Rodney Dillard and a photo montage. 41 pages. 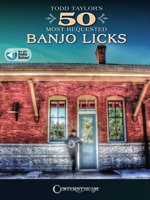 Exciting arrangements by banjo virtuoso Todd Taylor that are both challenging and fun to play; sure to become your favorites. The music is in standard G Tuning. 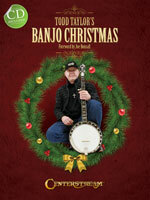 Listen to the CD to hear how the banjo should sound and play along with the note-for-note tablature of each song. 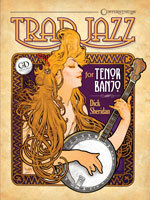 A perennial feast of banjo music to enjoy now and to rediscover year after year. So lets tune up, spread the cheer and play. Intermediate to Advance level. Part of a universal repertoire familiar to all traditional jazz musicians, the 35 standards in this collection are arranged for the tenor banjo but chord symbols make playing suitable for all banjo tunings as well as other chord instruments. Popular keys have been chosen, with melodies in notes and tab, plus large, easy-to-read chord diagrams, lyrics, commentary and more. Includes: Margie, Wabash Blues, Tishmigo Blues, Avalon, Shine, Back Home Again in Indiana, Shinny like My Sister Kate, St. Louis Blues, Jazz Me Blues, Old Green River, By and By, Yellow Dog Blues and more. 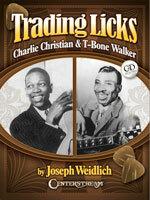 Trading Licks: Charlie Christian and T-Bone Walker explores the musical commonality of the founders of electric jazz guitar and electric blues guitar respectively. While both were heavily influenced musically by the Kansas Territory blues bands, T-Bone Walker ended up working professionally in the late 1930s in the looser rhythm-and-blues genre that was developing at that time in Los Angeles, while Charlie Christian began working in the number one dance band in the nation, the Benny Goodman Orchestra. This book explores how commonly used jazz licks were �reinterpreted� in an R&B context that are still just as exciting to listen to and to play today, as they were in the 1940s, when they were first heard on Central Avenue in L.A. This book includes an audio CD with 83 tracks of examples from the tablature!